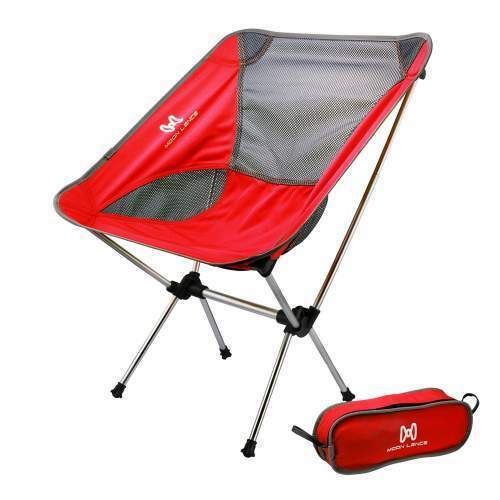 In this text you have 12 best ultralight backpacking chairs available on the market in 2019, all fully collapsible and with the weight below 1 kg. All the chairs in the list are collapsible by the design, this is natural if you plan to carry them on the trail. 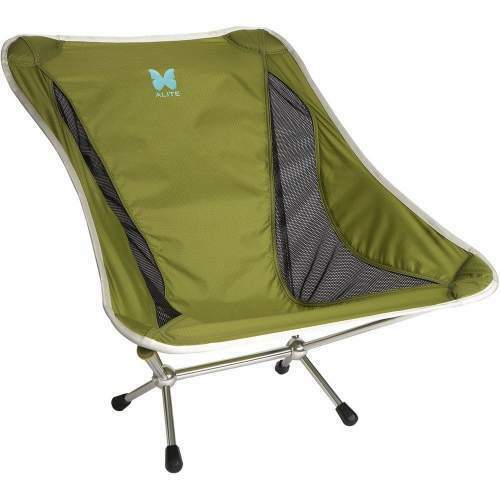 This makes them different from folding chairs which you normally have for ordinary camping. This also implies that the chairs need assembly, but this is usually done in seconds. In all types here you have shock-corded poles that make the frame so you cannot lose any part of them and you can also make them ready even in the darkness. All the chairs here are also designed for off the ground sitting. But some are really low. Regarding the weight, I put the upper limit at 1 kg. Most of them are described in detail in my separate reviews. These are quite expensive items, constructed from ultra lightweight yet durable materials, only the most reliable models from renown brands are presented here. The chairs below are ordered by weight from heavier to lighter. The LEKI Sub 1 is an aluminum construction with bonuses. 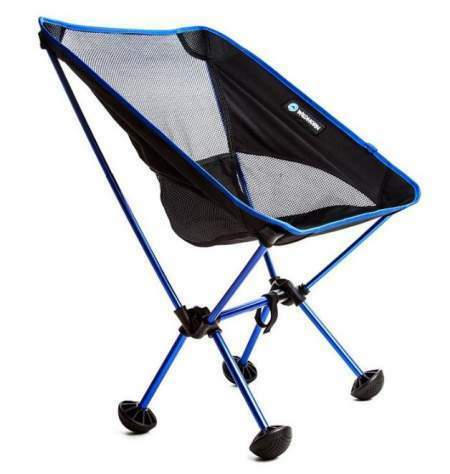 Those include a removable cup holder and an elegant carry bag that doubles as a storage pouch because you can attach it to the frame as shown in the picture. The most important numbers are as follows. The weight is 2.07 lb (940 g) and the capacity is 320 lb (145 kg). The seat is 11.8 inches (30 cm) above the ground. The packed size is great, 13 x 5.5 x 5.5 inches (33 x 14 x 14 cm). Please see more in my full review. 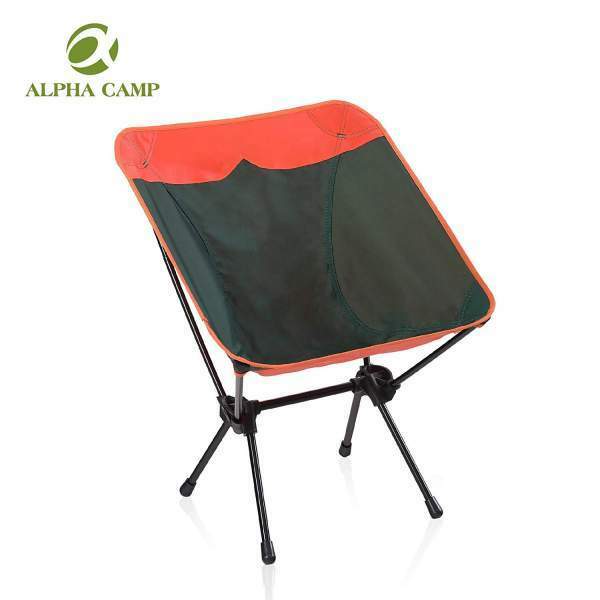 ALPHA CAMP Lightweight Portable Camping Chair. This ALPHA CAMP chair is one of several chairs here in the list with the same weight, so it appears that the competition in this weight range is big and many of the brands are trying to get below 1 kg of weight. So it weighs 2 lb (907 g) and it really packs nicely to only 14.2 x 4.7 x 4.7 inches (36 x 12 x 12 cm). The seat height is 16 inches (41 cm). The capacity is also great, it supports the users of up to 350 lb (159 kg), so plenty of reasons to have it in the list. But see also its price, it is only around $35 and you will not find many items of this type that can match this price. 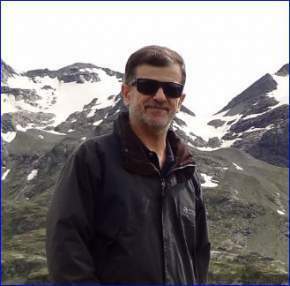 Please follow the link for more. Moon Lence Compact Ultralight Portable Folding Camping Backpacking Chair. This chair comes with a price tag that is without a match as of the moment of writing this text. So if you are on a budget this is the chair to consider. 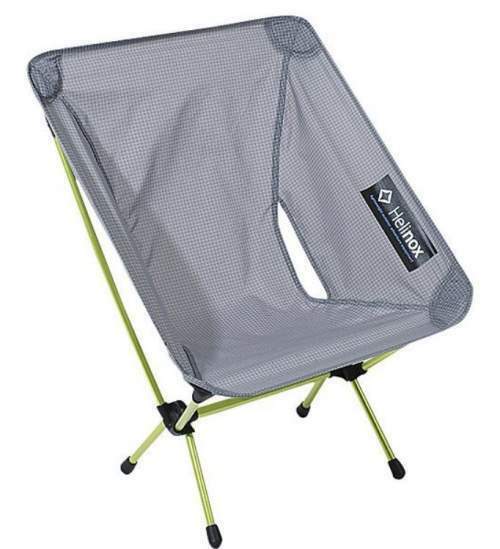 They sell it on Amazon under the name Moon Lence Compact Ultralight Portable Folding Camping Backpacking Chairs and this is because they have two chairs which they sell at the same place. This low-back chair is with the weight of 2 lb (907 g) and its capacity is 242 lb (110 kg). Yet another feature where it shines is its incredible packed size, it is only 14 x 5 x 3.5 inches (36 x 13 x 9 cm). So the chair is backpack portable and very versatile. Please read more in my full review. 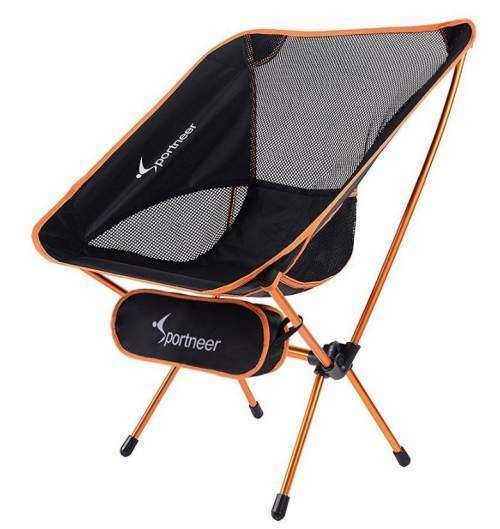 Sportneer Portable Lightweight Folding Camping Chair. This Sportneer chair has been on the market for several years already and it is very popular, with hundreds of customers’ reports on Amazon. It is here because of its weight which is remarkable 2 lb (907 g). The capacity is also great 350 lb (159 kg). The packed size is such that you can attach it to the backpack or carry on a bicycle, the carry bag is only 14 x 5.5 x 5.5 inches (36 x 14 x 14 cm). But what set it apart is its price which, at the moment of writing this text, is below $30. If you buy two of them they are below $50. Please follow the link for updates. 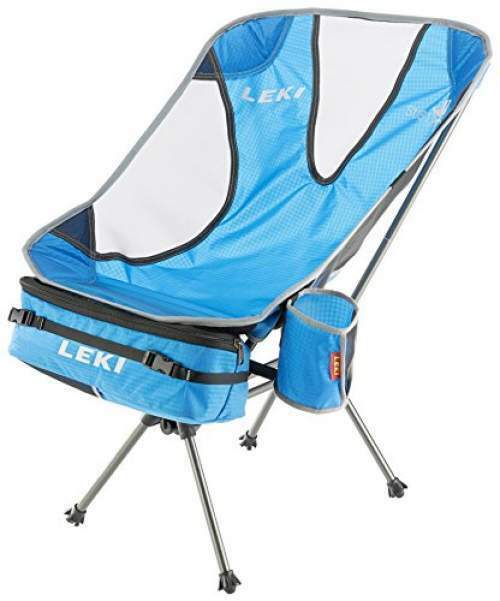 Trekology YIZI GO Portable Camping Chair with adjustable height. This YIZI Go chair gives a lot of information already by its name. So you realize that you have something unique here – the adjustable height. This is achieved by a mechanism in all 4 legs. You can extend them and have 3 different heights. This chair is here in the list because of its weight, so you have 2 lb (907 g) when it is in its carry bag. Hence, this is indeed a portable chair as its name suggests. In fact, it is light enough to be carried on the trail. This is a very reliable and popular chair with around 400 customers’ reports on Amazon alone, and it is very highly rated by the users. But this is also an incredibly affordable item, with the price which is hard to match. Please follow the link for more. 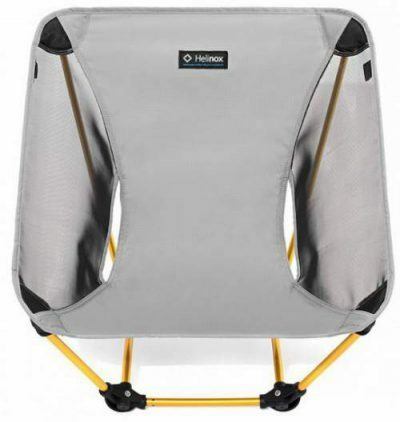 WildHorn Outfitters Terralite Portable Camp Chair. The Terralite chair is with the same weight as several other chairs here in the list. So this tells you that the competition is very strong here. What sets this chair apart is the fact that it comes with a spare set of Terragrip feet, you can see them in the picture. You will use them when you plan to use the chair on a soft surface. They will give you a good stability even on a sand. There is a difference in the weight with standard and Terragrip feet. So with the standard feet, it weighs 2 lb (907 g). 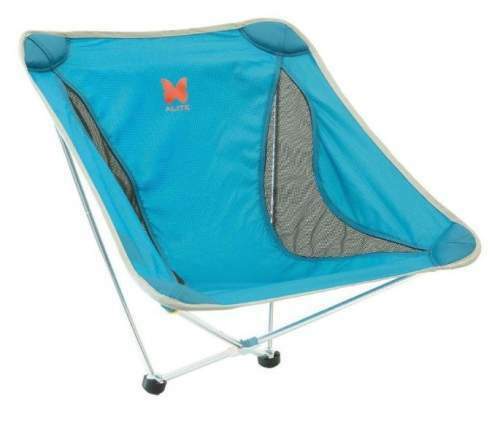 This qualifies it to be in this group of backpacking and hiking chairs. The capacity is very good, 350 lb (159 kg), and the packed size is also excellent, it packs to (L x D) 17 x 4.7 inches (43 x 12 cm). Note also that this is a very affordable chair. Please follow the link for more. 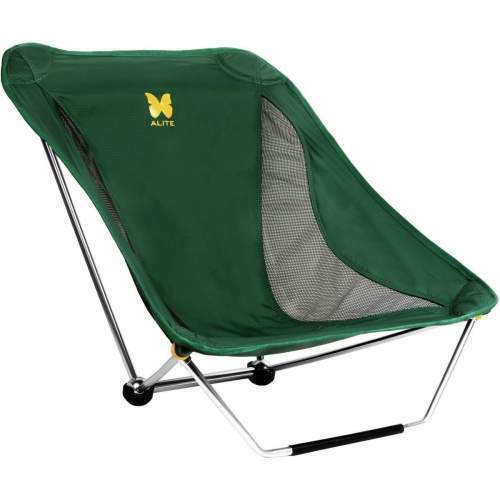 Big Agnes Helinox chair one. This chair is available in no less than 12 different color combination. The weight is 1.9 lb (0.85 kg) and it supports the weight of up to 320 lb (145 kg). Its packed size is also great, it reduces to 13.8 x 3.9 x 4.7 inches (35 x 10 x 12 cm). The seat is quite high above the ground, its lowest point is at 13.5 inches (34.3 cm) of height. Like the other chairs here, this is an aluminum collapsible structure. Please read more in my review. The packed size of this chair is (L x D) 10 x 5.5 inches (25 x 14 cm) and the weight is 1.8 lb (816 g). Yet it supports up to 250 pounds (113 kg). It is built in many different colors. This is a tool suitable for a variety of activities like sitting on the beach, at summer festivals, or simply enjoying in the backyard. But it is lightweight enough to be carried on the trail as well. 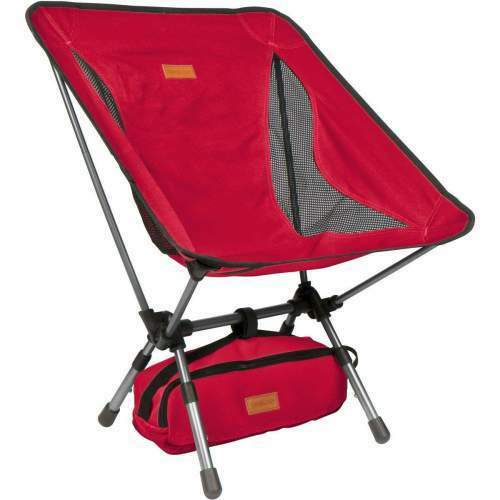 The frame is a durable 7000 series aluminum and the fabric is 210D ripstop nylon. As you see from the picture, the chair is with 4 points on the ground and you have plastic caps. Such a structure is great for a hard surface but not so great on a very soft terrain. Its measures are (W x D x H) 22 x 21.5 x 29 inches (56 x 55 x 74 cm). It comes in a nice stuff sack with instructions printed on it. Perhaps it is best to start with the legs of this chair because it has some unique features. As you realize you have the front bar plus the two points on the back connected with yet another bar. So such a structure will hardly ever sink and it is suitable for practically any ground. But there is more to this design. The front bar is removable and you can use it as a swinging chair, quite the same as you have in the Monarch chair below from the same brand. This is a very lightweight and compact design. The weight is only 1.4 pounds (635 g) and its packed size is (L x D) 11.5 x 4.3 inches (29 x 11 cm). But this chair has the capacity of 250 lb (113 kg). So this is a tool suitable for backpackers and hikers and also for camping, outdoor concerts, and beaches. The frame is a sturdy and lightweight 7000 series aluminum, all is shock corded, but the front bar is a separate piece. The fabric is a very breathable 210D ripstop nylon. Note that it is rather low, just 2 inches (5 cm) above the ground. So if you prefer something higher check other models in the list. With 1.35 lb (615 g) of weight, this is a true ultralight chair, and it supports up to 265 lb (120 kg). The packed size is 12.2 x 5.9 x 5.9 inches (31 x 15 x 15 cm). The frame is all one single shock-corded piece so the setup is easy. Observe that this chair has bars instead of legs, and it has them many. This makes it suitable even for a soft ground. It will not sink regardless of where you use it. More in my full review. This Monarch chair is something totally unique, a chair with two legs only. It has been on the market for a decade already. In view of its two legs, it is surprisingly comfortable. You have a strong aluminum frame which is able to support up to 250 lb (113 kg). But it is here in the list because of its weight, so you have only 1.3 lb (590 g). The packed size is 12 x 4.5 inches (30.5 x 11.4 cm). Please read more in my full review. The Chair Zero is an exceptional design, it has such a high back section, but it weighs only 18 oz (510 g). If you leave the stuff sack at home, you have only 17.3 oz (490 g). So imagine that such a chair can support up to 265 lb (120 kg), this is quite remarkable. You have quality DAC poles used for the frame, all segments are shock corded and setting it up is in seconds. The packed size is 13.8 x 3.9 inches (35 x 10 cm). So this was my list with the best ultralight backpacking chairs. Note that this list will be updated regularly, so bookmark this post and visit it from time to time. 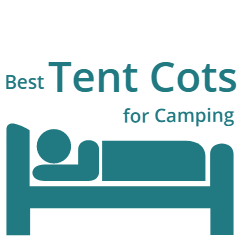 If you need something more suitable for ordinary camping please check in the category Camping Chairs here in the site and check my list with the best collapsible chairs for camping. 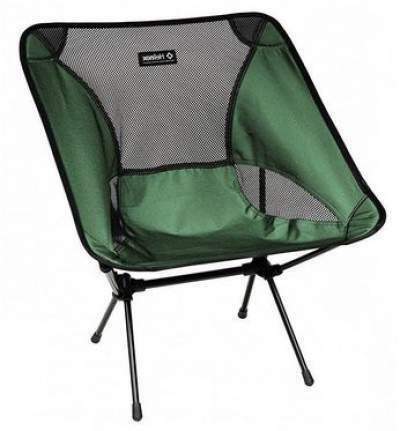 See also my list of the best folding camping chairs.